TIME TO DUST off this blog! To say “I have been busy” is lame; we are all busy these days. Help yourself to a mix of upcoming news and a look at what I’ve been up to. 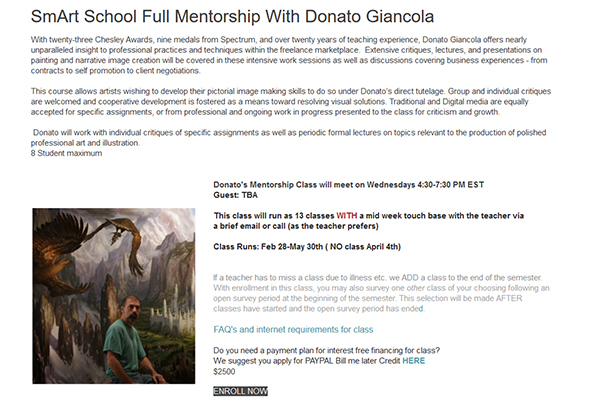 The prospect of attending the virtual SmART School under Donato Giancola, starting next month, excites me more than I can say. I was fortunate to land one of only eight slots he makes available here. Donato and I have been friendly acquaintances for decades. I got to know him a bit back in 1998 when my ex and I brought him to town for a phenomenal science fiction event for the Phoenix Library system. 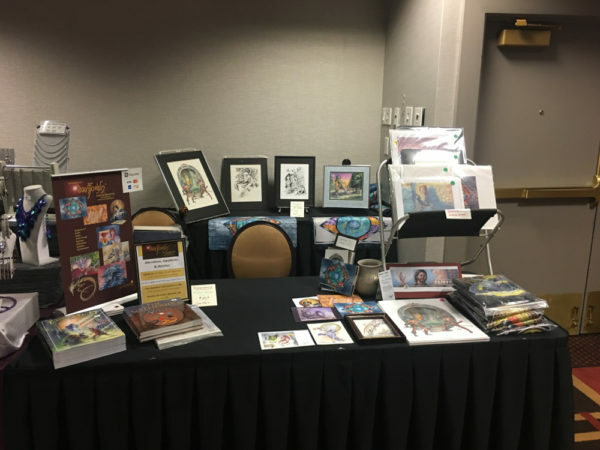 Donato and space artist Bob McCall showcased the visual arts for the event, while the likes of Saberhagen, McKiernan, Turtledove, Roberson, Rawn, Lindskold, Vardeman, Zahn, and Foster spoke of the craft of their writing in the genre. Donato’s professional star has gone supernova since then, and we have touched base when I attended IlluxCon these last few years. Studying under his mentorship directly is going to be a significantly different experience. I’ll be honest: last year’s run of conventions wore me out completely. They were worthwhile in every case but OMFG they took a lot out of me. I am cutting back this year. I am skipping IlluxCon, much as I love it, and trying to be sure the ones I am doing are spaced out. Magic the Gathering Grand Prix in Seattle: April 5-8. GenCon in Indianapolis August 2-5. Despite exhausting me, last year’s shows delivered a lot of motivation and inspiration personally, professionally, and creatively. I enjoy seeing old friends, meeting new people, talking with folks who enjoy the work I do and have done in the past. 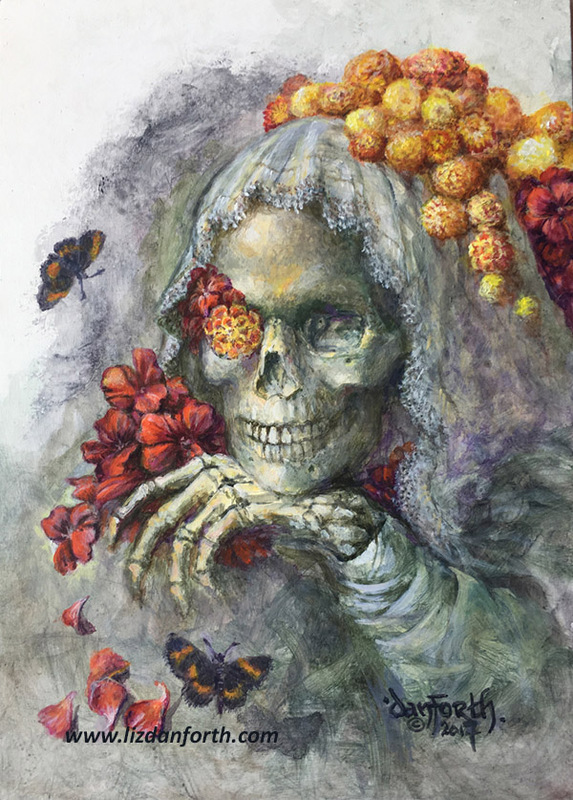 IlluxCon had the most impact, a show that spotlights the fine art side of imaginative realism. Yet even more energizing than the show itself, was my excusion to the Brandywine Conservancy and Museum of Art. Best known for being home ground and a key archive of the Wyeth clan’s art, the Brandywine kindled a blaze of inspiration and determination in me that… well, I have nothing to compare it to. It changed me. In the most narrow terms, I came away determined just to do more—more art, different art, even if it’s not for publication, assignment, or commission. Now I do more work extemporaneously. And I’m a little more willing to experiment and maybe fail in order to learn, getting outside my comfort zones. The last six months brought up this sampling of the more promising results, all quite different. Hover for details and more information about each. THE OTHER REASON THESE WORKS EXIST…? If you haven’t heard about it before, the Patreon platform brings creators and supporters together. It is the busker’s deal: I do something I love, and those who enjoy it throw a few bucks into the hat. This arrangement buys the creators time to pursue ideas they couldn’t do otherwise. It means I can keep the dog in kibble while still doing my regular assignments, but with less paper chase and freelance desperation. My supporters get to watch a project unfold, see behind the scenes, hear about the stories behind the pictures. If you’d like a lengthier discussion of my Patreon projects, and the stories around the examples I’ve shown here: I hope you’d consider signing on. I write on Patreon much more often—usually twice a month. Most posts are for patrons only, but some are open to everyone. (A few private posts flip over to public ones after supporters get a long first look.) The public posts give you a glimpse of what you might find behind the scenes. I do not plan to stop writing new posts here. But I struggle to get this Oakheart site on my priority list. Chunks of it are getting out of date, too. I might move it all to a different platform where I can showcase what I do, but with less blogging and more Making. Meanwhile, I’m going to provide a few links to pages of this site that people regularly want but may find hard to locate. • This page tells you how to contact me for signed cards or painted card alterations. Yes, I am happy to do both or either. 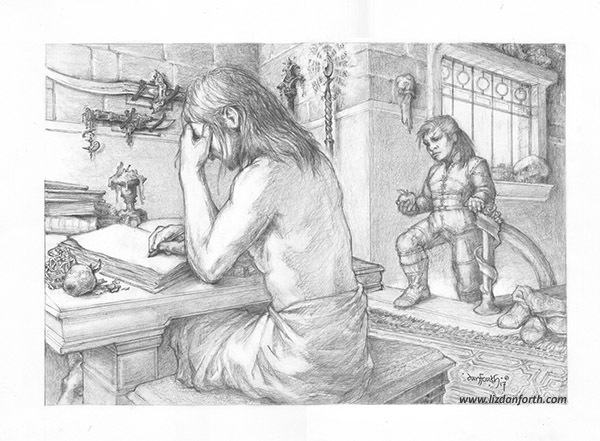 • This Card List details the 187 paintings I have done for various card games: Magic the Gathering, Middle Earth, L5R, and a dozen others. • Contact me if you are interested in purchasing original paintings for any card game (or anything else) except Magic. Contact Josh Krause at Original Magic Art for what few Magic-related works I have for sale, and some prints. • At present, I am quite overwhelmed with private commissions, but if you want to discuss it, this is where you should start. • At present, the best place to see projects I have worked on is on Pinterest. The page here on the website is more detailed but a horrible muddle. I hope 2018 is starting off well for you. Let’s meet at an upcoming convention, have a chat over on Patreon, or in the comments here! This entry was posted on Thursday, January 18th, 2018 at 3:30 pm	and is filed under Art, Commissions, Connectiveness, Conventions, Creativity, Dogs, Mages and Sages, Musings, Patreon, Site. You can follow any responses to this entry through the RSS 2.0 feed. Both comments and pings are currently closed. Thanks, Liz! I love the “frangled” design, but I couldn’t see an implied narrative. Can you enlighten me? It certainly IS rather abstracted, but the presence of an actual figurative element (the skeleton in this case) is unusual in my frangles — and it is the primary clue that this one is a little different. 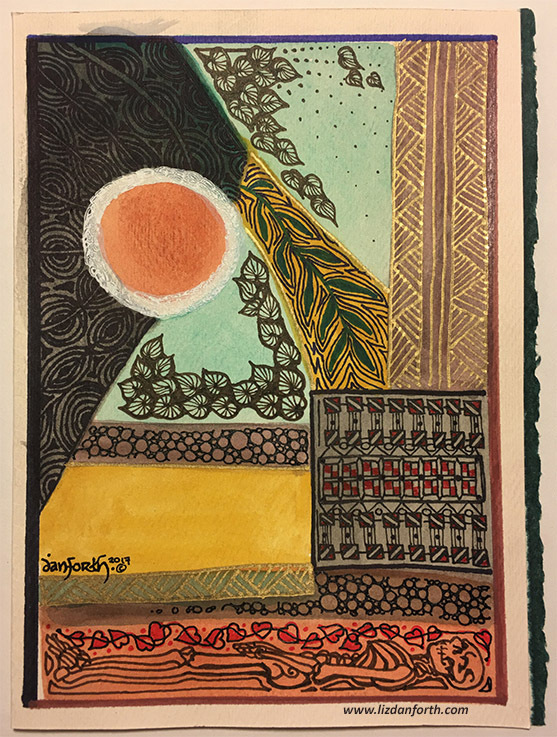 My intent/read of the piece begins with the orange circle as a sun with white corona, the leaf-like designs suggest fecund earth, the dark-on-dark design as the reaches of distant space. The relatively harsh square of black and red on grey can be read as a human-made construct like a building, or as a Two Grey Hills blanket covering the grave where the skeleton lies under the earth, which is layered with the pebble-designs and the yellow loess. The hearts are for the beloved dead. As I said on my Patreon (where there is more discussion of this piece), this one came about organically and unintentionally. I am NOT, by habit or nature, this pretentious or precious or “Ahhrtsy”! But once I saw the image taking shape, I ran with it. And without trying to be pretentious about it having “great deeper meaning”, I think it worked out quite well and rather accidentally took on a somewhat deeper meaning than I expected. PS – love the bridal skeleton!